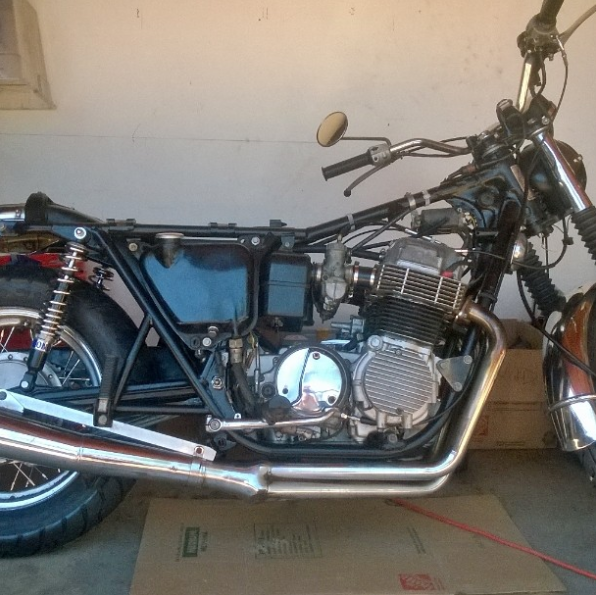 When you’re ready to start tearing down your project motorcycle, it’s a good idea to have a plan in place. Assuming your work space is set up, you’ve gathered the tools and supplies you’ll need, and you’ve got the shop manual handy, the exact flow of your disassembly will be up to you. Don’t rush – rushing through things is a surefire way to make mistakes and get disorganized. Keep calm – motorcycle parts only respond to your frustration by breaking. Stay organized – keep like parts together, make as many notes and pictures as you need to remember how to reassemble the bike. Have a process and stick with it – a process will help you feel like you’re making progress as well as help you stay organized. Don’t make blind guesses – If you’re unsure about how to remove something or wondering why something won’t come apart, don’t force it. Refer to your motorcycle’s shop manual, look online, or ask a friend – chances are there is a sequence to the removal that you’re missing and once you do it correctly, it’ll come off easily. Your mindset is key when doing anything on a motorcycle. If you’re angry, frustrated, or thinking about something else, you should probably wait to start working on your bike. The general tips below will help you get started on your motorcycle project and help you deal with issues you may encounter along the way. Move the bike into your workspace in an area where you have enough room to move around to different sides of the bike. Before you remove anything, give the bike a surface cleaning and try to get rid of or scare away any critters and bugs that have made a home in the old bike. Depending on where the bike was stored, it may have become a sanctuary for spiders. A shop vac can come in handy for a quick surface pass. Pick a place to start – starting with smaller components and parts that cover access to other parts is usually a good place to begin – carbs, seat, tank, side covers, etc. Save the bigger parts and the parts that allow the bike to stand and move around for last – engine, wheels, handlebar, side/center stand. Decide if you want to break everything down and then start cleaning or take off a part, clean it, and move on to the next one. Place small parts and pieces that go together in separate bags and boxes. Make labels and notes on which parts go where and how. Take pictures of what you’re doing. Have dedicated spaces in your work area where you can separate dirty parts from clean parts. Find a piece of cardboard that’s larger than the engine cover you’re removing. Trace the outline of the cover on the cardboard. Poke holes around in the cardboard trace that correspond to the bolts on the cover. Remove one screw at a time, placing it in the hole in the cardboard that represents that hole in the engine. Once all the bolts are out and secure in the cardboard, store it in a safe place. Proceed with cleaning the engine cover. If you bought your classic motorcycle for a decent price, chances are that it’s covered in grime, dirt, and rust. Buckets or tubs for soaking, rinsing, and scrubbing. When cleaning old motorcycles, especially when you’re tearing down the entire bike, be prepared to spend a lot of time soaking, scrubbing, scraping, and repeating the process a few times. Grime buildup and rust that accumulates over the years on a parked motorcycle can take a few passes to remove. Be patient, take breaks. Soak the part to be cleaned in warm water and cleaning solution or dish soap to loosen the grime. In an empty tub or bucket, scrape and scrub the part with rough scrubbing pads and get to hard to reach places with cotton swabs and toothpicks. Once you removed all you can, take a break and soak the part some more. If scrubbing won’t remove the remaining grime, you can try carefully using a wire brush or wire wheel to loosen it more. Do not use a wire wheel or wire brush on any gasket surfaces. Soak the rusty part of rusty area in rust penetrating solution or vinegar. Scrub with a wire brush, sandpaper, and scrubbing pads until most of the rust and discoloration has been removed.